- West-east contacts based on Portuguese doctrine of Mare Clausum - "closed sea" - authorized by the Pope - around 1480, confirmed by Tordesilhas Treaty with Castile (Spain since 1496), which divided the globe in two: the West for the Spaniards and the East for the Portuguese. 3. 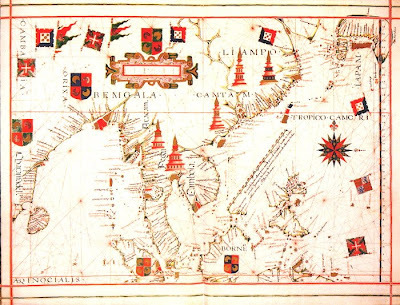 The Portuguese "Estado da Índia"
Goa, northern India, Tibet, East Africa, Malabar, Ceylon, Bengala, Malaca, Indonesia, Northern China, Japan, Southern China, Indochina. Jesuits were the most organized, efficient and successfully missionaries, very popular among local communities due their remarkable capacity to respect native cultures and get the sympathy from local elites. 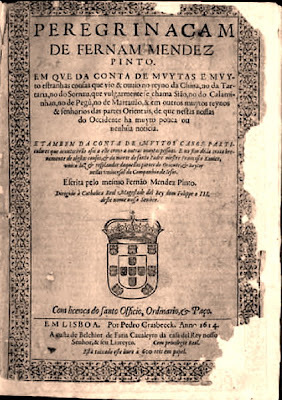 Each province should provide to Rome an yearly report ("Cartas Ânuas") containing every major and minor events that happened within past year. Since they were banned from Japan, they settled their activity for South-East Asia in Macao. 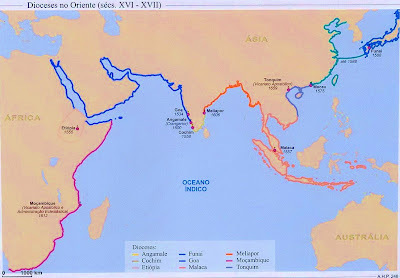 The lost of Ceylan, Malaca and Ormuz, endless wars against European rivals and regional ascending powers (Oman, Atcheh"/Aceh), Japanese isolationism under Tokugawa shoguns and the rise of Manchu Qing dynasty in China forced Portugal to opt for a new global policy. By the middle of 17th century, the Portuguese chosed Brazil has priority, due the the obvious natural ressources and scarce native population, not socialy and stately organised as the asians that Portugal was forced to deal with in the Indian and Pacific oceans areas. In Asia remained some traces of its past glory: Goa, Daman and Diu in India, Macao in Southern China and East-Timor in Indonesia. Indian Ocean became a secondary scenario. 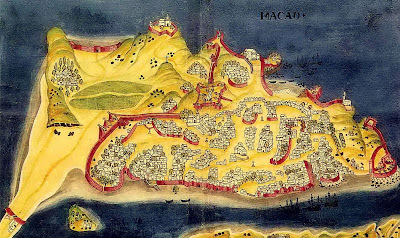 Thus, Macao became the main Portuguese commercial and religious city in Fart East, enjoying a large autonomy, both economic and political. Local Senate had firm control over junk trade permissions trough the "cartaz" system. This monopolistic advantage remained until the size of Hong Kong by the British in 1842, despite all Dutch and French attempts to intercept and disrupt such prosperity. Contacts between both countries have been kept, even in bad moments when Siam fought for Its independence and restoration under King Taksim and Rama I reigns. With the complete integration of Siam in international community, diplomatic relations have been managed first by Portuguese governor of Macao, and further by representatives of Portugal in Bangkok. Many adventurous Portuguese settled in Burma, Siam, Cambodia and Vietnam. Most of them used to be sailors, mercenaries soldiers and many others former officials who had deserted from their posts. In South East Asian kingdoms, they got marriage to local women and they were called “casados”. 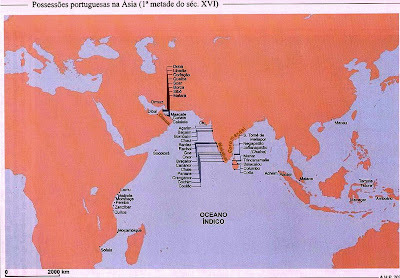 Throughout 16th, 17th, 18th and first quarter of 19th century, important Portuguese descendent communities were formed along the shores of Indian Ocean. 1. Use of Portuguese language, which was the Lingua Franca (pidgin, a trade language used by numerous communities). 2. Conversion to catholic faith, but remaining many characteristics of cultural background. 3. Specialization within the social framework of dominant Buddhistic societies. 4. Privileges and exemptions granted by the local rulers (exemption from Corvée-style labour) and specialized work as translators and interpreters, oarsemen of royal barges, gunners and shooters, engineers, gunpowder producers and physicians. These communities were under the authority of a local catholic. 5. Lived in settlements called Bandel or Kampong in the periphery of the capital or close to the main commercial networks*. *Burma: Dagon (Yangoon) and Mergui, later in Mandalay; Cambodia: Udong and Kampot; Siam: Ayuthia, Tonburi, Bangkok, Chantaburi; Tonkin: north Vietnamese coast. 6. They use to be under spiritual guidance of Portuguese catholic priests. 2. First seen as responsible for Siamese isolationism, and further under Rama V very devoted to so called Conservative Siam and its leaders, the Bunnag (บุนนาค) family, mainly Chuang Bunnag (สมเด็จเจ้าพระยาบรมมหาศรีสุริยวงศ์). 3. Intermediaries in all contacts between Farang and Siamese authorities: Burney, Crawford, Finlayson, Roberts, Ruschenberger focused on them exaggerating the hostility towards foreigners. a) Arriving to the mouth of Chao Phraya, European boats were visited on board by an emissary sent by the governor of Paknam (ปราการ). 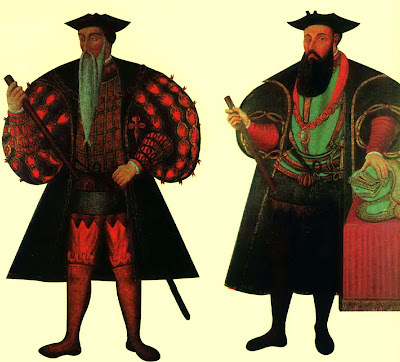 This emissary was the Captain of Bangkok Harbor – a Portuget – and they were asked about the reasons of the visit, the duration of the visit, crew number, the value of the gifts to King and Phraklang, the cargo and weapons on board. b) Meeting with the Governor of Paknam advised by Portuget interpreters. c) According to orders received from Bangkok, the visitors were taken in a boat whose crew was composed entirely by Portuget. d) Finally in Bangkok, visitors were housed in a special building and received the visit of another Portuget, the general of Siamese artillery, Phraya Visset or Pascoal Ribeiro de Albergaria. e) Meeting with the Phraklang and a Portuget interpreter. f) Informal meeting with the Maha Uparat and his private secretary, a Portuget. g) Formal reception given by the King (Rama III). The King used a Portuget interpreter. 4. For the protestant missionaries working for the London Missionary Society, the Dutch Reformed Church and the American Missionary Society, the Portuget were seen as papists and enemies, caused their loyalty to Rome. 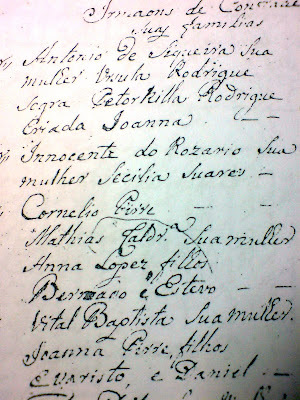 The authorization required to bring bibles and other printed books was carefully examined by a Portuget working for the Phraklang. 1. Auxiliary functions at the Court and Phraklang, but also relevant positions in the army and Navy. 2. 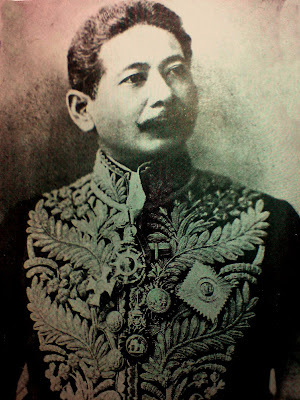 Within the Sakdina system, most of them were Phrai Luang, precisely Phrai Suay, but some of its members reached higher social status entering the nobility (Khunang) during the first decades of Bangkok period. The reason for that can be explained for the sudden lack of manpower and partial breakdown of noble families caused by Thai-Burmese war, but also due to the importance given by king Rama III to revitalization of the junk trade. 3. 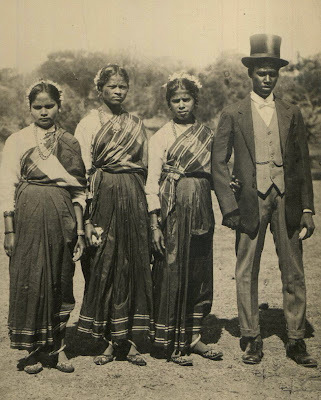 Among the most remarkable Portuget of this period, deserve special mention Phraya Visset Pascoal Ribeiro de Albergaria and Phraya Bibahd Kosa – or Celestino Maria Xavier – whose father was born in Macao and migrated to Siam during the first stages of the new capital. 1. The Catholic community can be defined as an hybrid ethnic group encapsulate by its religion and Eurasian origins, but sharing with the majority the main cultural values of Siamese society and political institutions. Under the protective shield of the system, this community has features which guarantee success and prestige. 2. Later, when the process of nation-state building was developed, the community lost its specificity and came to be competing by the new bureaucracy. However, many of its members showed great capacity and become essential businessmen in important companies. 3. Despite living in a urban society, they remained attached to their “urban villages” within Bangkok, close to their churches and keeping strong identity. The strategy for survival was to not lose none of the characteristics. By mid-nineteen century, other catholic Eurasians arrived from Macao and then the community managed to survive. a) Against the lack of openness of many French priests, which could not understand why the Siamese wanted to maintain social practices not in accordance with Euro-centered official Catholic teachings. Between 1780 and 1860, the community asked repeatedly to have Portuguese priests, but this wish could not be fulfilled since the Pope determined that the Mission of Siam should be managed by the Société des Missions-Étrangères de Paris. b) Against the rise of nationalism which meant that the Siamese should be Buddhists and thus other minority religious groups - especially the Catholics - would be the seen as representatives of colonial French power. Livre, sem lóbi, seita, loja, templo e partido, absolutamente indisponível para entrar em camarilhas, carregar malas e fazer de mainato.